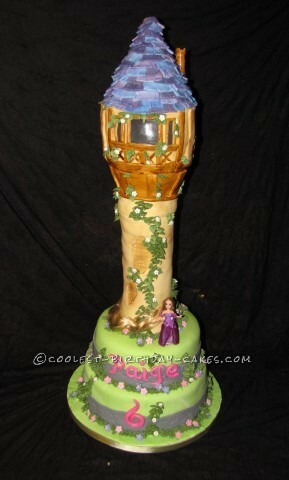 I made this Rapunzel Tower birthday cake for a friend’s daughter. I was asked to make a Tangled theme cake so of course the first thing that came to my mind was the tower. This was my first cake that required internal structure and in the end stood approx. 2 1/2 feet tall (by far my tallest cake too!). I enjoyed making it and required approx 2 days to get it all done with the details. We delivered the cake and when we got there the mom’s mouth dropped open in amazement! She then tells me “I was expecting a sheet cake!” (wished she told me that in the first place, it would have saved A LOT of work..lol).